Sometimes the question to answer isn’t the one that was asked. This is a guest post by Amy Chambers. The prospect of a job interview is enough to make anyone nervous. However, no matter how much you prepare, there’s often the possibility that your interviewer may have one or two questions up their sleeve designed to catch you out. What may seem like an unremarkable question may actually be a window for you to slip up. You don’t want to say something that is obviously a strength in disguise, such as ‘I’m a perfectionist’ or ‘I’m a workaholic’. This is too transparent and suggests that you aren’t aware of any flaws that you do have, or aren’t willing to admit them. You’ll probably benefit from being honest here, but not too honest. Offering a minor flaw, something that won’t affect your work or suggest you have any major issues, will demonstrate your honesty. This is an opportunity to turn an answer into something positive. For instance, you could say that you are aware that you need to work on your team building skills, your confidence with public speaking or that you need to remember to take more notes. Suggest something that isn’t too bad, and word it in a positive way to show that you are self-aware and willing to improve. Also, if you have been specifically asked about your ‘weaknesses’, say that you don’t perceive yourself to have any weaknesses, just parts of yourself that need to be worked on. Cath Newbould, a Resourcing Consultant for RBS Insurance, advises choosing something that you have made positive steps to overcome. She says: “Your initiative could then be considered a strength rather than a weakness. Under no circumstances should you say ‘I don’t have any weaknesses’ as nobody is perfect and it’s unlikely that the interviewer will believe you. 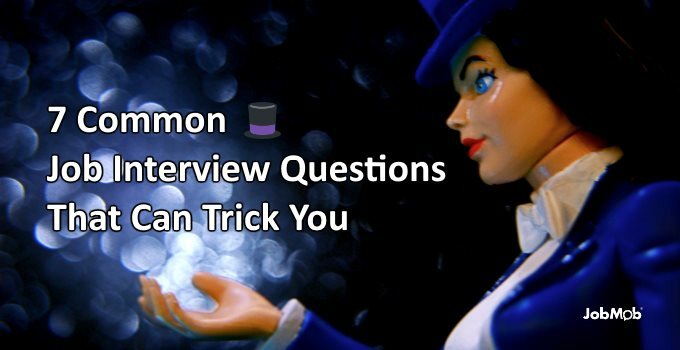 This may not sound like a trick question, but the interviewer could be asking you in order to test your preparation skills. If you have done your research on the company, you will answer this in relation to what they’re looking for, as opposed to a generalised answer of why you’re a desirable candidate. Again, use this as an opportunity to be positive. Never be defamatory towards your ex-colleagues, no matter how difficult they were to work with. Say that you wanted to push yourself out of your comfort zone, seek new opportunities and learn new things. This is a chance to be positive and show your determination. Equally, you don’t want to appear negative. If the role genuinely wasn’t challenging enough, say so in a positive way. This is not an opportunity for you to rant about your last employer, how the office was too cold or your computer mouse too sensitive. This is asked so the interviewer can test your maturity. Don’t fall for these types of questions. Avoid answering a question where you have to offer an example of something that could show you in a bad light. Reply by saying that you have never become angry at a colleague. The clever thing done by interviewers here is, by asking questions like this, you think it must be an acceptable behaviour. Just because you’re being asked to give an example – doesn’t mean it is expected of people. Don’t give any examples of being angry, lazy or unreasonable. Similar to the above, if this question is asked, it is so you will admit that you have, in fact, under-performed at work. Modestly reply by saying that it has never happened and then offer a for instance as to what you would do if it were to happen. “This one” is an answer that should be avoided as you may come across as too willing to please. Even if it is your ideal job, it’s always good to demonstrate to the employer that you have constantly evolving aspirations and something to work hard for. Your first response should be to ask if the question is intended for now, in five years’ time or longer, as this will assure the interviewer that your thoughts are organised and you are focused. The best way to impress would be to answer the question from a realistic point of view, and answer passionately. Don’t fall for this trap and say something negative, as any references you are relying on will most likely be completely positive. However, don’t give a great list of your strengths, either, be modest and keep it precise. Amy Chambers was unemployed for six months after graduating, but found her perfect job after maximising her CV using the tips and tricks she discovered online. She’s an HR geek and lives in the sunny South West of the UK. Subscribe to JobMob via RSS or email and follow me on Twitter for more job interview tips & tricks. 1. (to a female applicant) “Do you intend to have more children” ? – totally illegal question and you should get up and leave. you don’t want to work for this guy. 2. (to a male applicant) “Do you still do active reserve army duty” ? – same answer as above. 3. (First question on the phone after sending in your CV) “What are your salary expectations” ? This is a trap: go too high and you’re out, go too low and you won’t be satisfied. Try to answer something like “I expect a salary and benefits fitting someone with my experience and knowledge, make me an offer”. If they insist, try asking for more information on the job offer at hand before you answer. 4. The worst are places that send you to handwriting decipher and placement deficiency tests. give us a break ! We finished school. if you have a job to offer, make an offer. we want to work not do psychological tests, especially since they aren’t paying us for our time. Creating powerful answers to these questions can make a huge difference in the success of an interview. Find a buddy and practice! The way to avoid these traps is to really connect with the interviewer and turn the situation into a conversation between two human beings.